One 25-yard course will be used during each. Warm-up / warm-down lanes will be available throughout the meet. 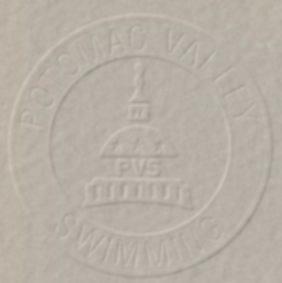 Open to invited Potomac Valley Swimming teams. Teams desiring invitations should contact the Meet Director at coacheric@snowbirdaquatics.com. However, please note that while we want as many PVS teams to participate in this meet as possible, space is very limited. Swimmers shall compete at the age attained on Saturday, April 19, 2008. PVS and host clubs along with their Meet Directors are committed to the Inclusion Policy as adopted by the Board of Directors. Athletes with disabilities are welcome to participate, and are asked to provide advance notice of desired accommodations to the Meet Director. The athlete (or the athlete’s coach) is also responsible for notifying the session referee of any disability prior to the competition. 11 and over Swimmers may enter a maximum of 6 individual events during the entire meet and no more than 3 individual events per day. It may be necessary to limit entries in certain events due to time constraints. Entries will be accepted on a first-come, first-serve basis beginning Tuesday April 1st, 2008. Once each session’s intended duration is met, entries will no longer be accepted. Dive-over starts will be used at both 11 & Over sessions. Time Trials: No time trials will be held at this meet. Coaches are responsible for the conduct of their swimmers and families, as well as maintaining clean team areas. Coaches & deck officials are required to display their valid 2008 USA Swimming credentials. Coaches are responsible for ensuring that their team areas are clean of any debris at the conclusion of each meet session. There is no admission charge. Meet programs will be made available at www.snowswimming.org by Friday April 18th at 12pm. All certified officials wishing to volunteer to work this meet should contact Alan McCorkle. Please include your club affiliation, certifications held, and sessions you wish to work. Certified officials who have not previously volunteered should contact the referee upon arrival to make their services available. A comprehensive officials briefing will precede each session during warm-up. Each participating club is requested to provide at least one official and 3 timers per session if entering 25 or more swimmers. Due to the limited pool deck space, no chairs are allowed on deck. Include with your commlink file one report by name and one by event. Create these reports in HyTek Team Manager and save as Word for Windows files. In the body of your email, provide entry numbers (girls, boys, totals). Include contact information (e-mail, phone, officials contact). HyTek computer disk entries are required. Entries may also be submitted on a PVS Master Entry Sheet. All entries must included a completed PVS Entry Cover Sheet. Events and time standards (.hyy files) for use in Team Manager are available online. The entry deadline is 5:00 PM, TUESDAY, April 8th, 2008. Important: The Meet Director will acknowledge receipt by return email within 24 hours. Teams submitting entries that do NOT receive an acknowledgement should contact the Meet Director by other means to confirm receipt. The above date is the deadline for teams to submit their entries to the Meet Director. Therefore, teams usually set an earlier deadline to receive entries from their swimmers. Check with your team for this information. Entries directly from individual team members will not be accepted. Entries by phone or fax entries will not be accepted. Entries that are incomplete, submitted on incorrect forms, or lacking the phone number of a responsible team official will not be accepted. Only short course times are applicable. Each participating team is requested to remit one check to cover the entry fee for the entire team. Please make checks payable to “SNOW Swimming”. Please do not send cash. Entry fees are due with each team’s entries. Unpaid fees will be reported to the PVS Administration Office at the conclusion of the meet. No further entries will be accepted from teams for future meets until entry fees are paid in full.